Mosquitoes have been called the most dangerous animals in the world because of their role in the transmission of so many deadly diseases. An understanding of their reproductive biology forms a critical part of the knowledge we need to design new strategies to control them. New findings concerning their sexual activity and the effect of malaria infection on their reproductive traits have been published recently. 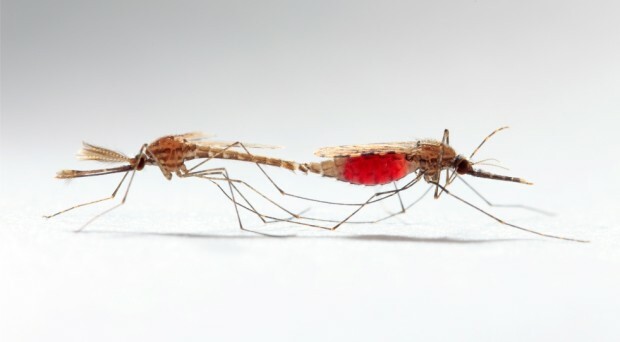 A female anopheline mosquito (the vector of human malaria parasites) mates only once. The sperm received is stored in a spermatheca ready to fertilize all the eggs produce during her life time. Further mating is prevented by her partner who, in addition to sperm, deposits secretions from his accessory glands that coagulate to form a plug that prevents other males from mating; a sort of chastity belt. The mating plug also contains large quantities of a steroid hormone, 20-hydroxyecdysome (20E) that profoundly affects the physiology of the female. It increases egg production and stimulates egg laying. Most importantly, it affects her competence as a malaria vector as it reduces immune responses directed against the parasite and increases her longevity, thus increasing the chances that she will be infected and live long enough to deliver an infective bite. Flaminia Catteruccia and her research team have been studying the mating plugs of a major malaria vector, Anopheles gambiae. As they are not found in other genera of mosquitoes (groups that are not vectors of human malarias) the group questioned whether the evolution of this sexual trait was associated with the enhanced capacity of some mosquito species to transmit malaria. They examined mating plugs in nine species of mosquitoes that are geographically dispersed. The three African mosquitoes (all important malaria vectors) had solid mating plugs, the Asian and European species had less congealed plugs and the New World species had no plugs at all. The four important malaria vectors in Africa and Asia all had high 20E levels in the ejaculate whereas the New World species had negligible amounts. Using maximal parsimony they determined that the most recent common ancestor of these mosquitoes did not produce a mating plug or sexually transfer 20E. The researchers propose other aspects of female physiology may also have coevolved in response to changes in male ejaculate; notably a female protein that interacts with the 20E hormone and feeds into a mechanism that promotes parasite development. They conclude that the coevolution of these sexual traits is “likely to have fundamentally influences disease transmission to humans”. These traits may increase the fitness of female mosquitoes but being prone to infection with the malaria parasite comes with considerable costs. Many studies, including those from my own research laboratory, have shown that Plasmodium infections reduce mosquito reproductive success. Ana Ribero and her research team have been using a natural bird malaria /mosquito infection system with good effect to study these fitness costs. The group have recently reported another aspect of egg laying that is affected by infection. Unlike anopheline mosquitoes that transmit human malaria, Culex pipiens lays its eggs in rafts that float on the water surface and egg laying can extend over two weeks. Another blood meal will only be sought once eggs are laid. The length of this egg-laying cycle is thus of critical importance for transmission of malaria. A long cycle will mean less host contact and could protect the vector from the dangers of host defences while the parasite is developing but not yet infective (the oocyst stage). However the provision of extra proteinaceous nutrients that might benefit the parasite will be delayed. Using strains that were insecticide-susceptible or insecticide-resistant they found a shortening of the time to egg-laying when insecticide-susceptible mosquitoes fed on infected blood. Laying eggs earlier avoids the reduction in the number of eggs that hatch if eggs that are laid later. This response, known as fecundity compensation, was not seen in insecticide-resistant insects. The researchers considered whether parasite or host might be driving this response and come down in favour of a host-driven compensatory mechanism that comes at a cost that an insecticide-resistant mosquito may be unable to bear. Their second paper addresses the issue of costs that malaria infection might inflict on the next generation (so called intergenerational costs) by comparing the offspring of mosquitoes fed on a malaria-infected or an uninfected canary. Mosquitoes from the F2 generation were then also fed on infected or uninfected birds. In contrast to some parasitic infections, no protective immunity was passed on from infected mothers to offspring. Neither did maternal infection result in a poorer immune system. Considerable intergenerational costs of malaria infection did, however, occur. As expected from the previous studies, mosquitoes feeding on an infected bird laid their egg rafts earlier and infection reduced fecundity but a far greater fecundity reduction occurred in the offspring from infected mothers. They laid 25% fewer eggs than those feeding on an uninfected bird. Egg hatch rate was affected in a similar way. Although mosquitoes from infected mothers excreted less haematin (a by-product of haemoglobin digestion that acts as a proxy for blood meal size) their statistical analysis indicated that taking a smaller blood meal did not entirely explain the fecundity loss. Having a mother that was infected with malaria imposes a huge cost on a mosquito. If this intergenerational cost is also born by Anopheles gambiae then the benefits of 20E transfer during mating may be out weighted by the costs imposed by malaria infection in areas of high parasite transmission. Neglected Tropical Diseases- to elimination and beyond! Many thanks for pointing out this error which has now been corrected.